I love making gift packaging for my Christmas presents and Stampin' Up! have the most fabulous Little Square Pillow Box Thinlits, which are perfect for just that job. I used the super cute Winter Wonderland Designer Series Vellum Stack, which at 6" x 6" fits the thinlits beautifully, I didn't even need to cut the vellum paper stack down to size. The vellum paper stack is on the Weekly Deals this week at £6.75 and has 36 sheets in each stack, and you need 2 pieces for each box so you could make 18 of these super little boxes with just one packet of the vellum. I think the vellum pack is great value. I used the A little Something Stamp Set which co-ordinates with the Thinlits for the sentiment. 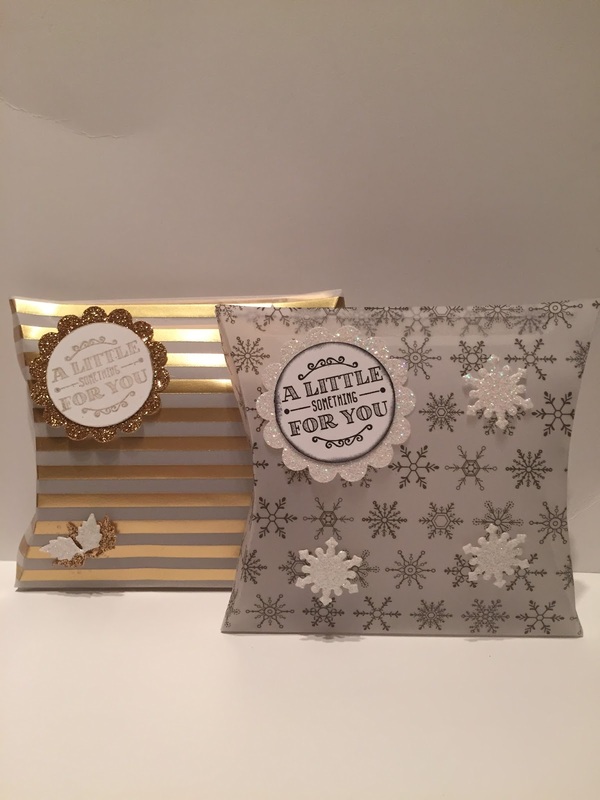 The Thinlits come with lots of little extras die cuts for you to use to die cut super cute pumpkins, leaves, christmas trees and snowflakes. I cut some of the little snowflake from the Thinlits to decorate this box. I made another box also this time in a stripped gold vellum from the pack and used the lovely little leaves die to cut out gold and dazzling diamond leaves to decorate the box. They took no time to do and I love the way they turned out, and the great thing is that the Thinlits and stamp set come as a bundle so you save extra money. It's a win win. If you would like to make these great little Christmas/present boxes I have added the items used at the bottom of the page. 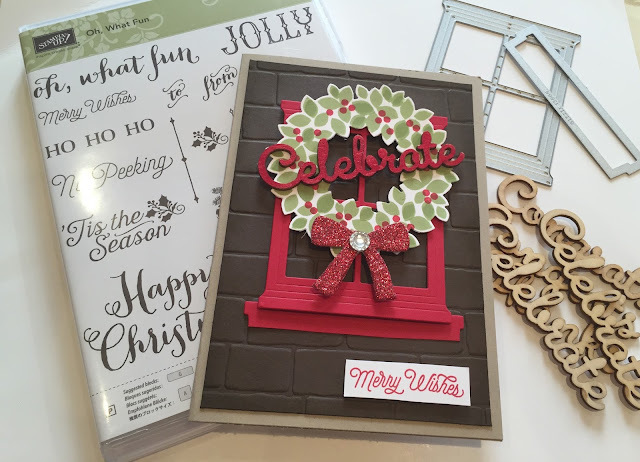 I love the font on the words in this set as they give that festive and playful element to any card. I've made so many cards using this set and they all look super cute. 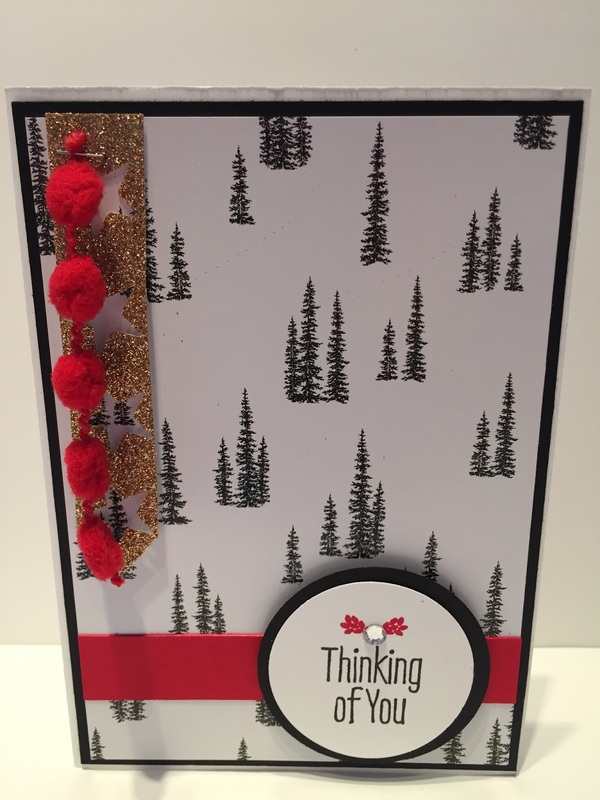 I've also used the lovely Peaceful Pines for the trees and the really cute Curvy Corner Punch for the edges of the front card. A bit of Real Red Pompom trim and Very Vanilla Striped Satin Ribbon and it was all done in super quick time. Hi I have just returned from a fabulous weekend at the Stampin' Up! On Stage Live 2015 where I meet up with lots of lovely other ladies and fellow demonstrators. We all enjoyed catching up and sharing our swaps. They were too many for one picture so I had to take two!! Aren't they fabulous I collected well over 70 swaps from other ladies. It's such fun going to these events and being able to share what you love with other ladies. 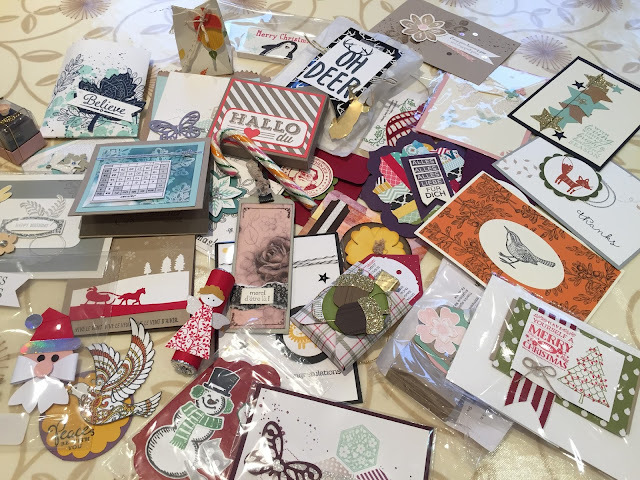 It gives you such a boast and reignites all those creative juices to come back and make more lovely cards and projects to share. I hope you have a fabulous day whatever you do and pop back on Friday to see a lovely Christmas project I'm making for a friend. I wanted to share the great Weekly Deals with you as they are super cute this week and great for Christmas Cards and gift bags. The lovely Metallic Foil Dollies 138392 on sale at £2.81 and the Winter Wonderland Embellishments - 139621 at £4.88 are just two of the super deals this week. Check out the other below. It's busy in my house today as I'm packing and getting ready to go on a trip to Brussels to join lots of other lovely ladies at the Stampin' Up! On Stage Live something you can attend if your a Demonstrator like myself. As a Demonstrator going to one of these events we do a lovely thing called swapping where we swap a card front or small project we have made with the other ladies, so you come home with lots of lovely cards and ideas for using other great stamp sets in the catalogue. I'm so excited as its going to be a fun few days. Please pop back on Friday to see my lovely swaps and how I made them. Remember to you my code club number if you make a purchase add the November Code Club no EPB4E3CW in the space before you check out to receive this months lovely free Stampin' Up! product gift. Please also tick the "I would like contact" as this helps me know where to send the gift out to, I will only contact you afterwards to ask if you would like to know about future special offers and I do not share your information with anybody. 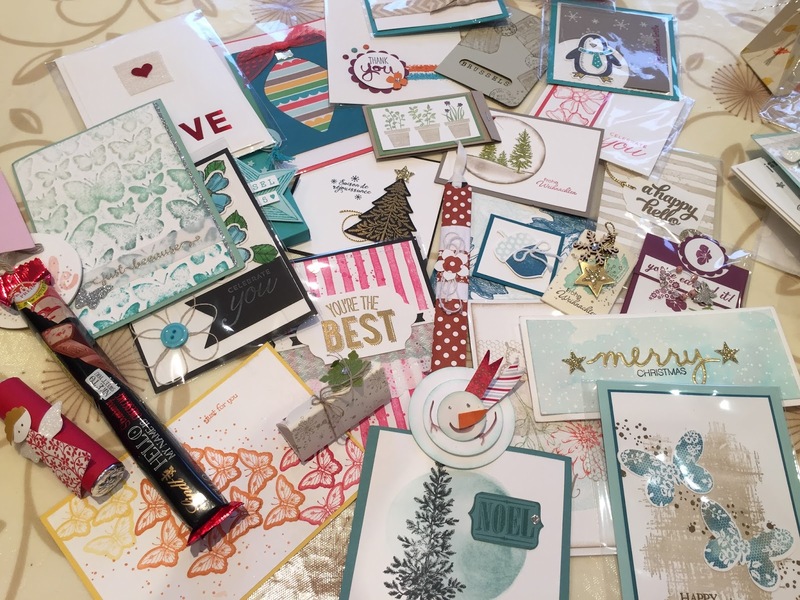 I wanted to make some quick and easy Christmas cards to send out, and the lovely Winter Wonderland Specialty Designer Series Paper by Stampin' Up!, was perfect for the job. You get 12 sheets 2 each of 5 double-sided designs printed with metallic ink on one side, and 1 each of 2 single-sided gold foil designs in each pack of paper. 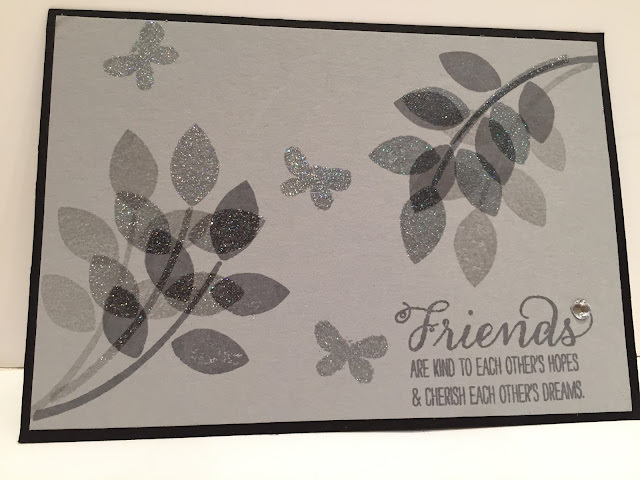 I stamped the sentiment on Whisper White using the stamp set "A little Something". I then cut this out using a 1 3/4" circle and then popped the sentiment on a 2" circle of black card stock. I coloured in the image on the stamp set using Write Markers in Basic Black and Real Red. If you use the markers you can colour the different sections of the stamp different colours just like I have done, and it's so easy to do. I placed a Rhinestone in the middle of the sprigs of holly and the sentiment/topper was all done. 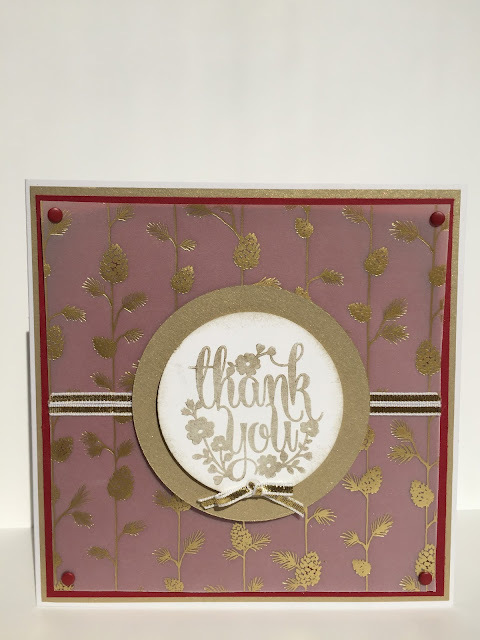 To finish the card off I punched 5 stars out of Gold Glimmer paper using the Itty Bitty Accent Punch Pack and placed that with some of the super cute pompom trim down the left side of the card using a small stapler from Stampin' Up! The card was super quick to put together and I used only a few things. The week is set to be super busy but I wanted to share another lovely card I've made with you. I'm in love with the super versatile Hearth & Home Framelits from Stampin' Up!. I've made baby cards with them, new home cards with them and now a super cute Christmas Card. The possibilities are endless and I can't put them down..... There one of my favourite Framelits from the Autumn/Winter 2015 Catalogue. 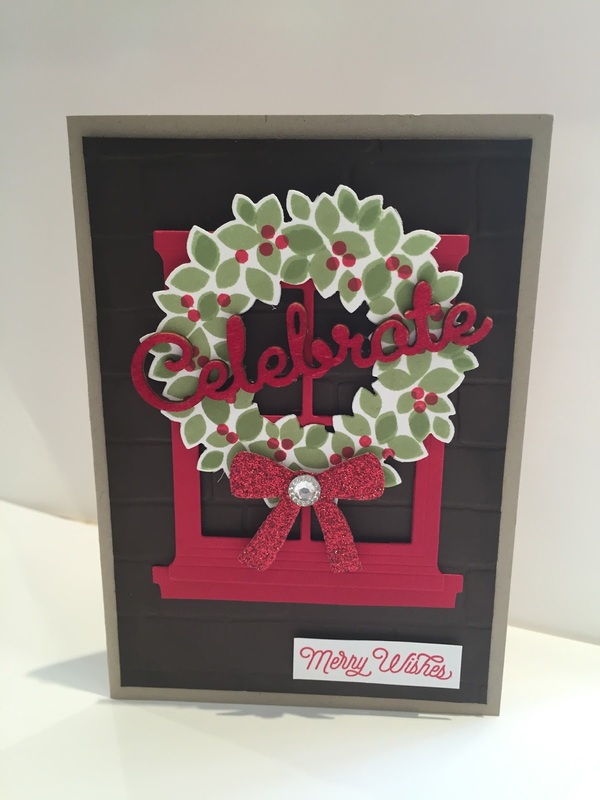 I love the way the window stands out in the red, and the little piece of Red Glimmer Paper makes the wreath pop with colour. Did you notice the background is the lovely new Brick Wall Embossing Folder the card just had to have that as the background. I inked up in real red the word Celebrate from the cute wooden elements doesn't it look cute. The card came together really well and I'm super pleased with how lovely it looks. Take care and pop back soon to see what else I've been up to. 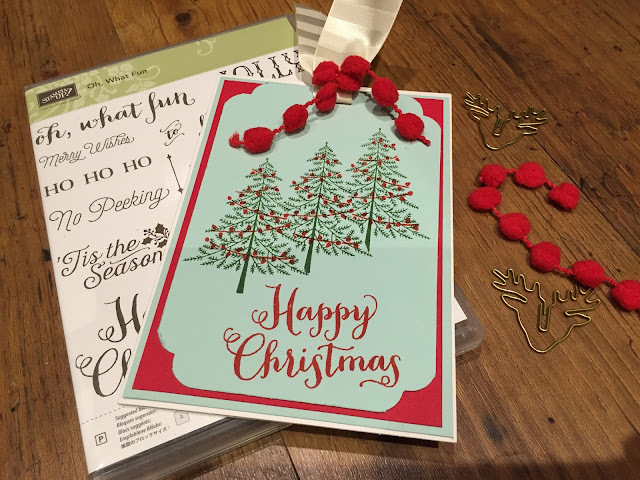 If you would like to make this lovely card don't delay in getting your goodies, everything is delivered straight to you door in only a few days. I have put all the products used in the table below. Just click to take a look. If you do make a purchase please add the November Code Club no EPB4E3CW before you check out to receive this months lovely free Stampin' Up! product gift, please also tick the "I would like contact" as this helps me know where to send the gift out to, I will only contact you afterwards to ask if you would like to know about future special offers.